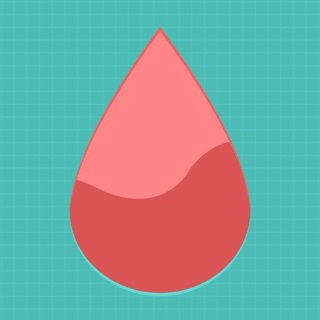 MyNetDiary’s Diabetes Tracker app is the easiest and most comprehensive diabetes tracker app for the iPhone. MyNetDiary can help you better understand and control diabetes and pre-diabetes - along with improving your diet, losing weight and providing feedback, support and motivation. MyNetDiary was featured in the 2017 Consumer Guide of Diabetes Forecast magazine, published by the American Diabetes Association, the world’s most trusted source of diabetes information. Designed for diabetes type 1, type 2, pre-diabetes and gestational diabetes. 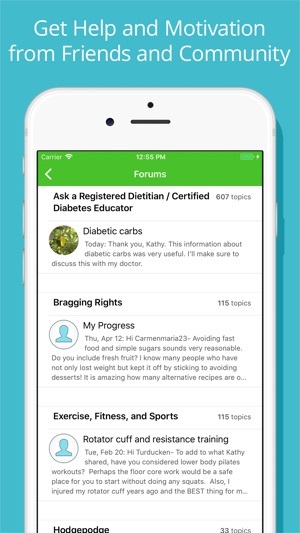 * This App (and website) has been a tremendous help in making lifestyle changes after being newly diagnosed as Type 2. 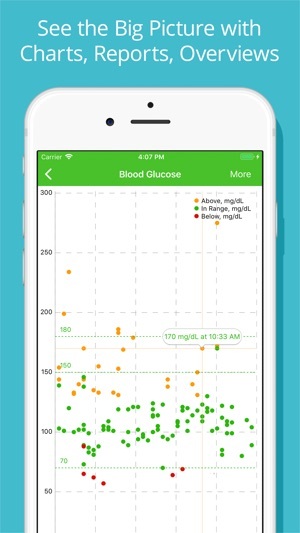 * This is the best app for diabetics trying to recover their health - without question. 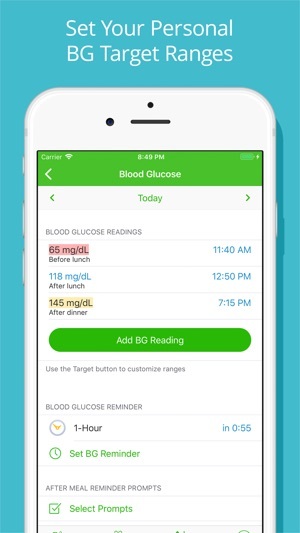 * I spent a lot of time researching diabetes apps, then chose this one over a year ago and have been using it everyday since then. It has exceeded my expectations for diet management (still can't believe how much info they have on foods, food groups, and packaged foods! ), lab and exercise tracking, and especially all aspects and ease of diabetes management. It gives me good personal feedback, keeps me on track, and has helped me and my physician meet my DM treatment goals. * Comprehensive blood glucose tracking. Custom pre- and post-meal target ranges. Highlights out-of-range readings. 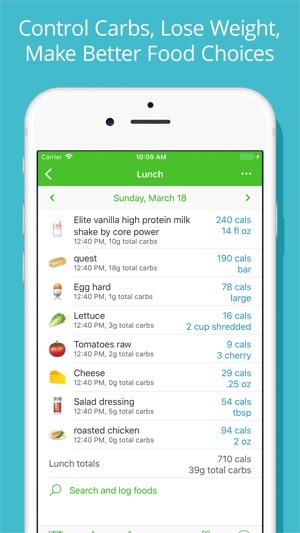 * The best food and carb tracking - with a great food database, built-in barcode scanner and quickest entry. THE DATABASE IS UPDATED DAILY. 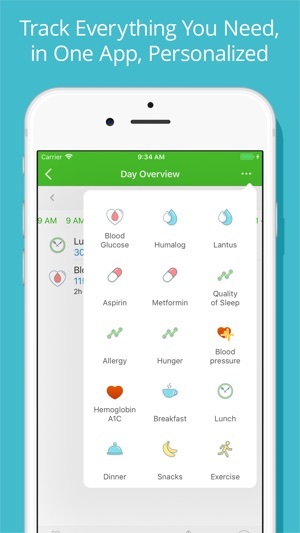 * Custom trackers - track anything - quality of sleep, symptoms, and more. * Detailed daily and weekly analysis, charts and reports. 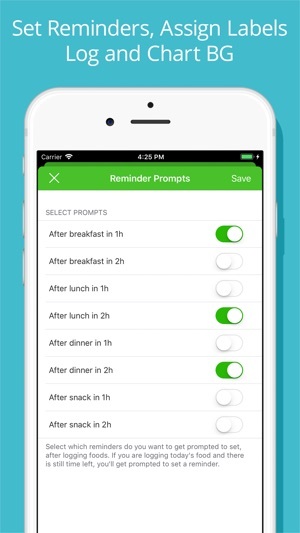 • Create shortcuts checking calories left and calorie deficit, as well as logging meals and water - to help you log faster, easier and reach your weight goal sooner. • Start and stop walking, running, and cycling workouts with built-in GPS tracker. MyNetDiary Maximum subscription provides premium features: sync with fitness trackers and body scales from FitBit, Jawbone, Garmin and Withings, special analysis, charts and reports, nutrient planning, step bonus calculation, and more. 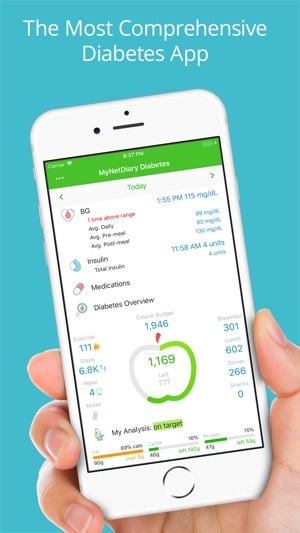 Diabetes Tracker by MyNetDiary is an educational tool, it is not a medical device, it is not a substitute for a medical device or medical care, and it does not provide diagnosis, cure, mitigation, treatment, or prevention of any disease. As always there are many other improvements and fixes in different areas of the app. * Much improved app for Apple Watch, faster and easier to use, with awesome set of complications displaying calories, macros, nutrients, or water on watch faces . * Visual Design Updates - stylish menus and dialogs, making the app look nicer. 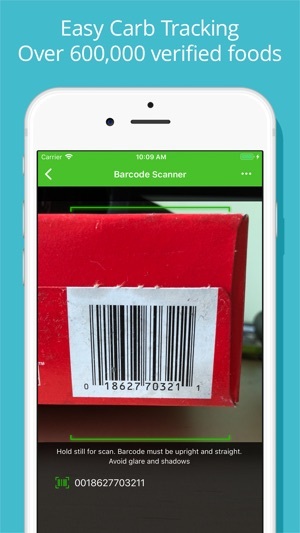 * Improved Food Logging - going to another meal on the same screen, starting barcode scanner from search bar, and more! 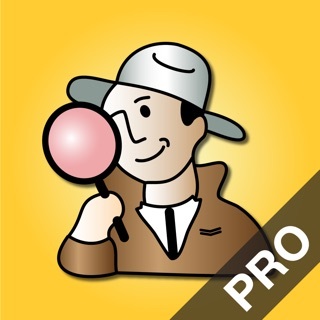 * MyNetDiary Maximum is now called MyNetDiary Premium, but it provides the same great features as before. Cataloging everything that passes your lips can be very tedious and all the times I tried writing it down I never seemed to be where my log was. With this app and our age of technology, I'm never far from my phone. I love that it interfaces with Fitbit and other apps. Yes the food library is a bit limited but the app provides ways to help them help us. It also allows you to put in your favorite recipe and account for things you'll never find in another place on the planet. It conveniently lets you scan the upc and in most cases, the dietary data is provided. When it doesn't, it's easy as pie to take a pic within the app of the front of pkg and of the nutritional data and they update the system as we collectively provide data. You can keep track of anything you want in this app and it's especially helpful to see trends. It's always a good thing to raise one's awareness and through the use of this app I've been able to significantly lower my A1C, lose 20 pounds over the last year and increase my awareness of what I'm doing to and for my body and health. The spreadsheet is miraculous to review with your doctor and see trends that support your health. My doctor commented, while I showed her the graph on her screen at the Ofc that she wished all her patients were willing to use technology to help themselves. It inspires me to see the guy descend the slope each time I'm able to show another pound gone. Yay for this app! 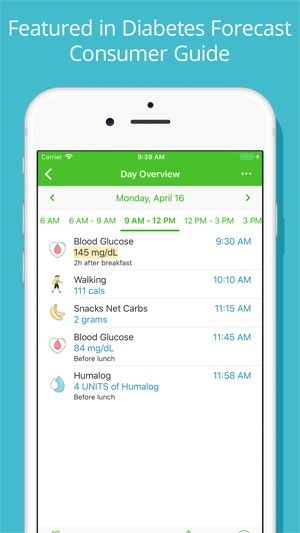 This app is similar to MyNetDiary with added features such as tracking blood sugar and other medications. It also syncs with other devices to track steps and exercise. I also like the note-taking function. I am using the Max version that I believe is worth the price. Besides diabetes, I have other medical conditions and I find this helpful for everything. Being able to log medications ensures that I don’t forget a dose or double-dose. My doctor appreciated that I could show her my blood sugar results over a period of time. This is also helping me to lose weight. Research shows that people who log their meals and weight are more successful. There is something about having to write something down that can really influence your choices! The app will also sync with some scales so you don’t have to manually input it (or cheat). 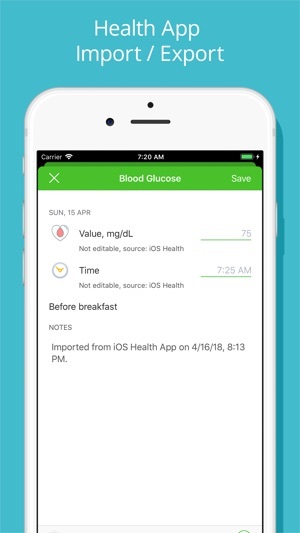 For me, this has everything I could ask for as far as an app that both helps me monitor my diabetes AND help me lose weight as well as monitor other medical issues. As an RN, I am used to “charting” patient activity, meds, and progress. For me, this is an easier way to do my own “charting”. MyNetDiary was my essential logging and guidance tool when I had to lose weight and get my diet into balance. Logging is a pain, even with a great tool, but for me it was the key to honest portions and steady progress. I could see my results in a wide variety of charts. In the long weight loss slog, an improving chart result was an encouraging boost. I love to cook and MyNetDiary let's me enter ingredients (scan them in with your camera) and create menu items that are an easy shortcut for entering favorite foods. You aren't stuck with only commercially available foods, although the program has a large and growing database of regular grocery items. I am still managing my weight and food intake with MyNetDiary. It takes a willingness to do the logging and be accurate with your quantities. (I highly recommend a scale.) Weight loss schemes come and go, but if you monitor and control your food, you can lose weight. I did.